Did you know that in just 5 minutes you could have a delicious serving of steamed mussels? 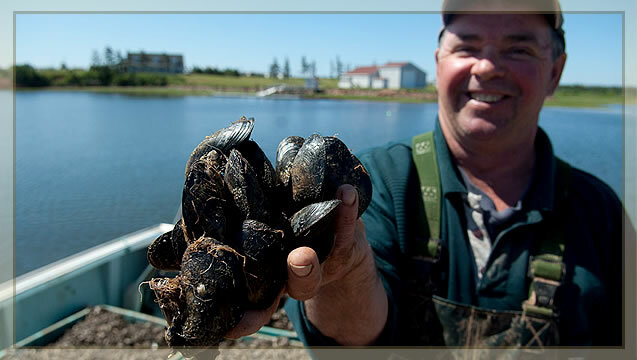 One of Mother Nature’s original fast foods, mussels can be prepared in a variety of ways; from steamed, baked, breaded, stewed, or tossed in a salad. 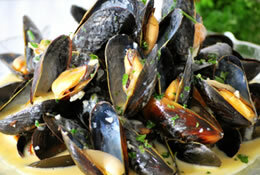 Place wine, garlic, onion and mussels in saucepan, cook on high for 5-6 minutes or until mussels open. Serve with melted butter (optional). Heat coconut milk, fish sauce, ginger and curry paste at medium high until sauce thickens. Add mussels and cook 5-6 minutes or until mussels open. Stir mussels into sauce, then sprinkle with chopped cilantro. Makes 4 appetizers or 2 main courses if served with Asian noodles or steamed rice. Place mustard, vinegar, and citrus juices in mixing bowl and whisk. Add oil in a slow steady stream while mixing constantly. Taste and adjust seasoning with salt and fresh ground black pepper. Saute onions and garlic in olive oil over medium heat for 3 minutes. 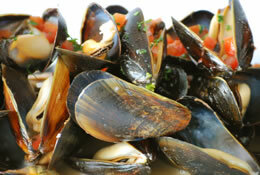 Add white wine and mussels, cover and cook on high until shells open (approximately 5 – 7 minutes). Remove mussels from the pot and allow to cool and remove them from their shells. Reduce the juice that is left in the pot by half. Cool and reserve. Toss mussel meat, vegetables, herbs, lemon zest with 1 cup of cooled cooking liquid. Add citrus vinaigrette and season with salt and pepper. Cook the pasta in a large pot of boiling salted water until tender but a little firm (al dente). Cool the pasta and toss with 1 tbsp of the olive oil. Melt 1 tbsp butter in a sauce pan and sauté shallots and garlic. Add mussels and white wine and bring to a simmer. Cover and steam for 5 - 7 minutes (depending on size). When the mussels are open, remove them and keep them hot. Reduce the liquid by half and add the cream. Reduce the cream until it starts to thicken. Add herbs and whisk in the remaining butter. Season with salt and fresh cracked pepper. Re-heat the pasta in boiling water and place it into the sauce. Continue to reduce the sauce until you reach the desired consistency. 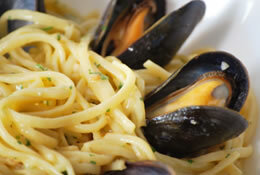 Place the pasta and sauce in pasta bowls and garnish with the cooked mussels. Place shallot, garlic, fennel seeds, celery, curry powder, and white wine in a sauce pot and bring to a simmer. Add Mussels, cover and let steam for 5-7 minutes or until the mussels are open. Remove mussels and place in serving dish. Bring remaining liquid to a boil and add cream, tomato, parsley and pesto. Season liquid with salt & pepper and pour over mussels. Heat 1 tbsp olive oil in a sauce pot and sauté shallots and garlic. Add mussels and white wine and bring to a simmer. Cover and steam for 5 - 7 minutes (depending on size). When the mussels are open, remove them and keep them hot. Reduce the liquid in the pot by one third, add the tomatoes, and simmer for two minutes. Add herbs, butter, Tabasco sauce, and season with salt and fresh cracked pepper and stir. Place the mussels in a bowl and pour the tomato broth over top and serve. Melt 1 tbsp butter and sauté shallots and garlic. Add mussels and white wine and bring to a simmer. Cover and steam for 5 - 7 minutes (depending on size). When the mussels are open, remove them and keep them hot. Reduce the liquid by half and add the cream. Reduce the cream until it starts to thicken. Add herbs and whisk in the remaining butter. Season with salt and fresh cracked pepper. 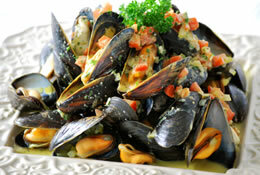 Place cooked mussels in bowls and pour the sauce over top or serve the sauce on the side as a dipping sauce.